The unofficial ASYLUM descriptionTucked away in Sofie’s wintery asylum with no hope of release for years, Evangeline must come to terms with her situation: the curse still plagues her, she’s now hunted by a two thousand-year-old vampire, and the guy she’s in love with tried to kill her. Plus, she’s locked up with a cranky Max and the Forero kids—two people everyone seems to prefer dead over alive. Things aren’t looking good. Meanwhile, back in Manhattan, Sofie struggles to keep forty trapped and bloodthirsty Ratheus vampires at bay and a desperate Viggo from killing Evangeline’s friends, all while hints stir outside the walls of the NYC vampire asylum of a war brewing between the Sentinel and the witches. Is there any hope for Evangeline and Caden? Can Sofie control the rival powers? Is the fate of Earth predestined? Isn't the cover just gorgeous? The release date for Asylum is sometime in January 2012 don't worry we'll keep you posted ;) and if you haven't read Anathema yet first why not? Second here's your chance Kathleen has decided not only to reaveal her beautiful cover here but she's giving away 2 ecopies and one signed copy of Anathema! Want to read this awesome book enter HERE! If you don't want to wait to see if you've won why don't you just purchase a copy? It's only 99 cents at Amazon and Smashwords. Make sure to check out Kathleen's blog also she always posts cool stuff there! It's so freakin' pretty! I ♥ it! 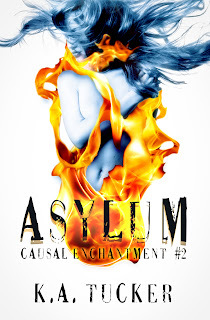 And I can't wait to read Asylum and own this book for my bookshelf!